Coming out of stealth mode soon! We have been making good progress on the application we are building at Spatial Networking, which in its initial release will run on the Facebook Platform. We plan to get an alpha release out to a small number of testers by the end of this week, and have a closed beta out within a few weeks after that. So I've decided it's time to start telling the world more about what we're up to, and I'll be doing this, and giving our first public demo, at next week's Boulder Denver New Technology Meetup Group, which is on Tuesday February 5 at 6pm in Boulder. I have found this to be a pretty interesting local group for anyone interested in technology startups. They had about 200 people at the last one. The general format is that 5 companies present for 5 minutes each (with 5 minutes for questions). So I'll have to be pretty concise, but I've been getting used to that with doing pitches to potential investors, who have pretty short attention spans :). If you're in the area please feel free to come to the Meetup, and if not I'll be posting much more information here in the coming weeks. 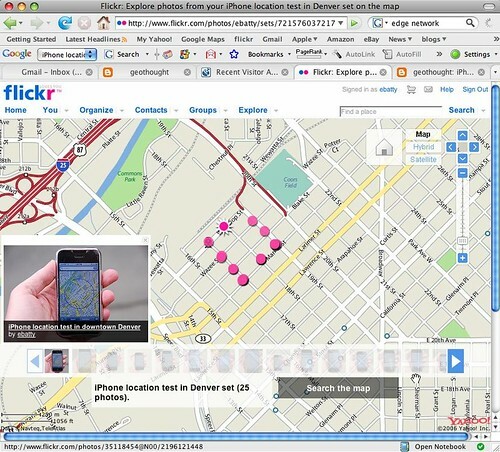 I just went out for a walk around my neighborhood in downtown Denver to test out the new "locate me" capability on my iPhone, and discovered something rather interesting: apparently the system is using not just cell phone signals but also WiFi to determine location, which explains the unexpectedly good first test result I mentioned in my previous post. I discovered this somewhat accidentally, but turning WiFi on and off on the phone made a big difference to accuracy. 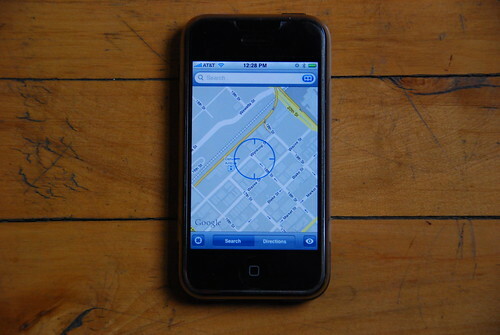 You do not have to be connected to a WiFi network in order to use WiFi for location determination. Since I am in a WiFi-rich downtown location, using WiFi gives much more accurate results than triangulating cell phone signals. From a quick walk around the neighborhood here, I am consistently getting within half a block, or perhaps about 50 meters accuracy most of the time, and as good as 10-20m in some instances, when I have WiFi turned on. Of course it won't be nearly that good if you don't have a dense WiFi network, but this is much better than I expected. If I turned off the WiFi on the phone, the results were less accurate. It is a little hard to gauge the accuracy as the map display is zoomed out depending on the level of accuracy that the system thinks it can obtain (and there is a variable size circle displayed). But generally speaking, even without WiFi, the location generally seems to be within a block or two (say 100-200 meters) of the right location - though again this is in a downtown location with a high density of cell towers, so in a rural location it will be significantly less accurate. If you look at Google's explanation of how "My Location" works, they only mention using cell tower location. I suppose that most of the other phones which have previously run Google Maps Mobile do not support WiFi, so this makes sense. Other vendors such as Navizon have used WiFi location for a while, and indeed they announced a version for the iPhone a little while ago (if you had hacked your phone, since of course it is still officially closed to third party applications at this point). But in general I haven't seen anything saying that Google was using WiFi for location determination. I did find that the accuracy varied a fair amount from one attempt to another - I could stand on the same street corner and locate myself multiple times in quick succession, and get three different map scales (representing different accuracy levels) back. The true geo-geeks among you can check out this flickr album, which shows photos of the location given by my iPhone as I walked around the neighborhood, and each one is geotagged using my Garmin handheld, which gives a pretty accurate location. I have added various notes as I went through. On an individual photo you can click the map link to get an accurate view of where the photo was taken (you'll need to zoom in a little), and you can also see a map of the whole set. Anyway, in summary, I am very pleasantly surprised with the performance of the location capabilities so far - the use of WiFi gives a much higher accuracy than I had expected. Not good enough for in-car navigation applications, but definitely good for local search applications. Update on my original post: Slashgeo reports that the WiFi positioning technology used in the iPhone is from Skyhook Wireless. One other comment I forgot to make before is that the location determination is pretty quick - typically 3-5 seconds for the map to refresh with the location, most of which is probably just the time to redisplay the map using the EDGE network. I am at home in my loft in downtown Denver and the center of the cross hair is pretty much exactly where I would have placed it on the map - within a few tens of feet of my location. I will do some more tests shortly, but it passed the first test well! Incidentally, the photo above was automatically uploaded to flickr using my new-ish Eye-Fi card, which is a pretty cool gadget in case you haven't come across it. It's an SD card which includes Wi-Fi, and once you've done some setup, it will immediately upload pictures wirelessly to flickr or other online photo sharing services. I don't always want to do that, but for situations like this where you just want to take a photo and get it online quickly and easily, it's great!